A few posts ago I wrote about stovetop broiling steaks with the "Guardian Service Griddle Broiler," so this time we'll put its "griddle" function to task with pancakes. 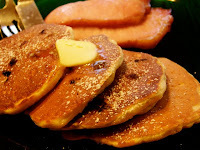 As Betty Gay waxes nostalgically in the Tested Recipes cookbook, "hot cakes or 'flapjacks,' as we called 'em back on the farm, with plenty of butter and maple syrup will make you feel that this old world's not so bad after all." I had two distinctly different grandmothers. My father's mother Pauline, who lived "back on the farm" in North Dakota and cooked three large meals for the family and farmhands every day, had a more practical approach to cooking. My maternal grandmother, Muriel, was a professional musician and an excellent cook with a few "signature dishes"—and blueberry pancakes was one of them. Muriel and Grandpa Ken rented a summer cottage in Rhode Island each year and when blueberries were at the peak of season she'd whip up memorable batches of those pancakes: light and fluffy but crisp and riddled with fresh berries running with juice that stained the cakes purple. Of course, she fried them stovetop in a quarter inch of oil in a cookie sheet... but as a once or twice in late summer treat, they were magical. There's nothing unique about the GS pancake recipe (just make sure the baking powder is still active; test by pouring some hot tap water over a half teaspoon of baking powder—if it bubbles, it's still fresh enough; if not, the pancakes won't rise). What's crucial here is technique: the timing and the griddle heat. Who needs Teflon? 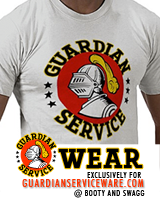 The trick to non–stick cooking on the Guardian Service Griddle is the heat. 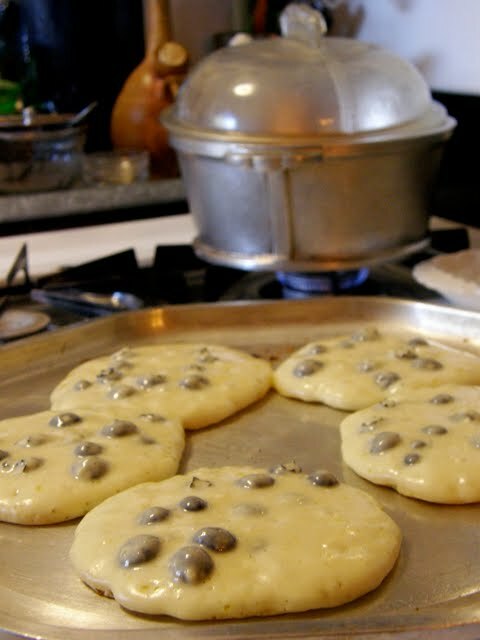 To prevent pancakes from sticking and burning, first warm the griddle for 5-7 minutes on a medium heat (1/2 flame on a gas stove) then test with a bit of cold water. I wrote about this "water test" in the steaks post, but I've taken a few more pictures to show you another example of the "dashing around like mad" effect mentioned in the cookbook: when the griddle is at optimum heat a bit of cold water poured on the griddle will retain it's shape, like globules of mercury rolling across the surface. If the water spreads out and sizzles, it's not quite hot enough and if it evaporates instantly it's too hot. Just set it off the heat for a few minutes. 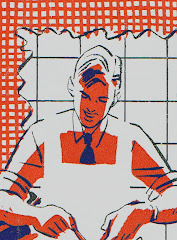 "No need to worry about overtaxing the family's digestive system because Guardian hot cakes are baked—not fried in grease," notes Gay in the intro to "Hot Cakes... without grease or smoke." 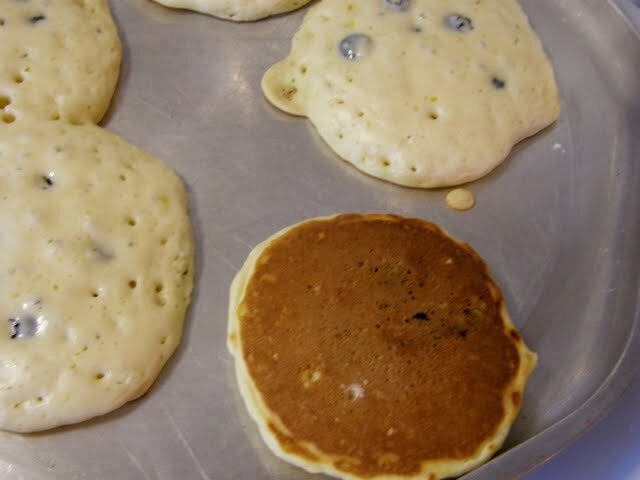 In effect, you are "baking" the pancakes on a greaseless griddle and, as with all GS cookware, the aluminum evenly distributes heat so you can cook 5 or 6 average-sized (not IHOP big-as-your-head sized) flapjacks at a time. 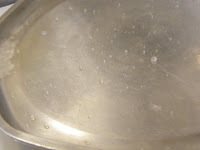 Timing: when bubbles appear on top, break and hold their shape, the under side has browned. Using a spatula, flip and brown other side. Place cakes in a pre-heated GS unit until ready to serve (keep the cover ajar so the steam escapes and they don't get soggy). NOTE: If you're not feeding an army, use 1 egg and halve the remaining ingredients for a dozen. Combine beaten egg and milk. Stir into dry ingredients, adding more milk if thinner cake is desired. Preheat griddle over medium heat, test for temperature and bake cakes as directed above.